Visitors are invited to discover Piero della Francesca�s works in the province of Arezzo, by following an itinerary going through Valtiberina, Sansepolcro, Monterchi - the native hamlet of Piero�s mother Monna Romana - and Arezzo. The Upper Valley of the Tevere river, or Valtiberina, is on the far east of Tuscany, and takes its name after the river that runs across it up to the border with Umbria. In the past, Valtiberina represented both the border and meeting point between different civilizations, the Umbri and the Etruscans, the Bizantines and the Longobardi. Piero della Francesca, in Borgo San Sepocro itself, was able to perceive the secrets of space and light, reflecting them into his works. The Civic Museum of Sansepolcro, the artist�s native town, holds four works, the Polyptych of Mercy, the Resurrection, San Giuliano and San Ludovico. After visiting Sansepolcro, the itinerary continues in Monterchi, in Val Cerfone. In Monterchi, which stands on the top of a hill on the border with Umbria, Piero della Francesca painted the extraordinary fresco of Madonna del Parto, in the old church of Santa Maria a Momentana. The itinerary continues and ends in Arezzo. A splendid town standing on a hill in eastern Tuscany, just behind the Apennines between Tuscany and Romagna, Arezzo used to be one of the most important Etruscan cities and later became a strategic centre for the Romans. 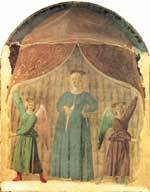 Here, Piero della Francesca painted one of the most important masterpieces of the Renaissance. The Bacci Chapel in the Basilica of San Francesco contains Piero della Francesca�s frescoed cycle of the Legend of the True Cross, painted for the Franciscan church between 1452 and 1466. The Dome of Arezzo displays the fresco Magdalene (at the bottom of the left nave). Piero della Francesca, whose true name was Piero di Benedetto de� Franceschi, was probably born in 1412 in Borgo San Sepolcro � the former name of Sansepolcro � in the upper Valley Tibertina on the border between Tuscany and Umbria, into a family of merchants who traded leather and wool and, later on, held a �guado� (dye-cleaner�s shop) which the Republic of Florence had created a monopoly on. Being the first son, Piero was expected to walk in his father�s footsteps; however, he soon preferred to pursue his artistic vocation. Piero learnt the basic rudiments of art in his native town, where he was trained by the only artist working there at the time: Antonio di Anghiari, as it can be inferred from a document, certifying payment (dated 21st October 1436) for an order for papal coats of arms and flags for the doors and towers of Borgo San Sepolcro, bearing the names of Antonio and Piero della Francesca. In his early training years, he also studied maths, which would later prove to be fundamental for the development of his painting technique; just like all merchants� sons, he was sent to �an arithmetic primer teacher�, namely a teacher of maths, algebra and geometry, so as to learn to keep trade accounts. He worked as an apprentice painter in a traditional and provincial environment, which gave little stimulus to such a young talented artist, who thus soon left home and began travelling. The date of 12th September 1439 was a milestone in the early years of Piero della Francesca and thus also in the Renaissance: on said date, in fact, it is proven that Piero was in Florence, where he worked with Domenico Veneziano on the frescoes of the Main Chapel in the Church of Sant�Egidio, representing The Stories of the Virgin Mary (the painting was later lost), which would strongly influence Piero�s training. In truth, Piero had already worked with Domenico Veneziano as his pupil; quite probably, they had already worked in Perugia in 1438, when Veneziano was engaged in painting �a room in the Baglioni�s house�, the powerful masters of the town, as recalled by Vasari. Unfortunately, these frescoes have been lost. At the time of Piero�s stay in Florence, when the cultural environment of the town was flourishing, the young artist had the chance of observing the most important artists of the time, acquiring experience and knowledge which deeply influenced both his exceptional personality as a painter and his humanistic culture; moreover, at the time, the Council was being held in Florence, thus drawing together the Christian West and the East to discuss the Holy Trinity. Representatives of the Greek world paraded through the town, bringing a wide range of suggestions, costumes and colours which stroke deep in Piero�s life. On said occasion, Piero met Pope Eugene IV and his Court�s humanists, among whom Leon Battista Alberti. In 1442, the artist went back to Sansepolcro and stood for civic magistracy offices. 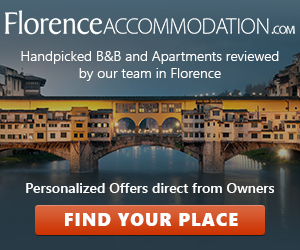 In the meantime, his town passed under the rule of Florence, having been surrendered by Pope Eugene IV in 1441, who was highly indebted due to the Council�s expenses. 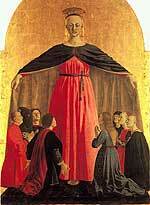 In 1445, Piero was commissioned the Polyptych of Mercy. In 1450, he signed and dated the painting San Girolamo di Berlino and then wrote the Treaty of Abaco. From those years onwards, his career developed around Sansepolcro, Arezzo and the most important Courts between the Adriatic Coast and Umbria, where he found intelligent merchants interested in giving also a cultural legitimation to their conquests. Moreover, Piero�s long stays away from Borgo profoundly prompted the creation of new local schools, independent of the Florentine style. After staying in Pesaro and Ancona - where he went back in 1450 to paint the frescoes in Cappella Ferretti in San Francesco � he went to Loreto (as documented by Vasari), where he was commissioned a fresco for the sacristy of the Church of Santa Maria. However, Piero fled the plague-ravaged region between 1447 and 1452, leaving his work unfinished. As reported by Vasari, Piero also created other works in San Ciriaco (Ancona). Hence, Piero stayed in Marche on several occasions, independently of his commitments in Urbino. This accounts for his profound impact on the area�s local painting. Piero then moved to Ferrara, at Lionello d�Este�s Court, who died leaving everything in the hands of his brother Borso. The destruction of Piero�s frescoes at the Estensi Court and in Sant�Andrea in Ferrara, was one of the most serious losses of his works, among many others. Piero found a stimulating environment at the Court in Ferrara, where he met the humanist Guarino da Verona; the Court, in fact, was also a model of humanist culture. Other than taking part in the lively debate on art, Piero was allowed to study the gems and coins collected by Duke Lionello, contributing to the secular programme of the small study of Belfiore. It was precisely in Ferrara that a painting by Rogier Van der Weyden was kept at the time. This allowed Piero to observe the great Flemish artist�s eye for detail and his command of oil painting. In 1451, Piero left Ferrara for Rimini, which was under the rule of the Malatesta, where he was commissioned the votive fresco of Sigismondo Pandolfo Malatesta in Tempio Malatestiano. In Rimini, Piero took part in the humanist restoration of the Tempio conceived by Leon Battista Alberti, namely the humanist and artist who, besides leaving important architectural masterpieces in Florence, deeply affected the Courts of Mantua and Urbino. 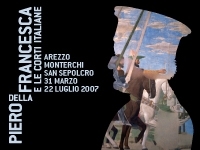 Shortly after completing the fresco in Rimini, he worked on the cycle The Legend of the True Cross in San Francesco in Arezzo, which was started after 1452, the year when Bicci di Lorenzo died (he had been entrusted by the Aretine Bacci family to decorate the choir of the chapel). Part of the vault had already been completed. In 1455, Piero was in Rome, painting frescoes in the Vatican for Nicholas V. He continued to work in the Vatican Palace also under Pius II, as confirmed by a receipt of payment. Unfortunately, these paintings were destroyed to leave room for other paintings by Raphael. In Rome, Piero met Francesco del Borgo, an architect and expert in mathematical studies, who was also in charge of modernizing the Basilica of Santa Maria Maggiore, where Piero�s decoration of the vault of the Chapel of San Michele can still be seen. In Rome, Piero was prompted to study perspective, and copied and illustrated Archimedes� treaty on the spiral, and also began drafting his treaty de Prospectiva Pingendi. Quite probably, Piero had already been to Rome for the Jubilee in 1450; said trip is not documented though is quite likely, given the Roman elements traced in his early 1450s paintings (Baptism of Christ and the first phase of the cycle of San Francesco in Arezzo). In 1467, Piero was in Sansepolcro, where he held new public offices; the following year, he fled the plague and went to Bastia, where he painted a banner. In 1469, Piero della Francesca was in Urbino at Federico da Montefeltro�s Court, where he was entrusted to complete an altar table for the Corpus Domini Confraternity, for which Paolo Uccello had painted the foot-pace. He later returned to Urbino between 1474-1478: at an increasingly Dutch court, Piero was able to strike a unique balance between his sense of shape and the new suggestions of the time. His two portraits of the Dukes of Montelfetro are one of the most renown works of the time, the synthesis of different trends combined in a unique painting technique. The Altar-piece of Brera and the Virgin Mary of Senigallia date back to the time he spent in Urbino. In 1478, Piero went back to Sansepolcro, where he received payment by the Brotherhood of Mercy for a Virgin Mary frescoed on a wall between their church and the hospital. The painter stayed in Sansepolcro until 1482, where he held important and prestigious public roles; documents also prove that the painter was quite wealthy at the time. On April 22nd , he moved to Rimini � for unknown reasons � where he rented a house with a back-garden and a well. In the last years of his life, Piero gradually withdrew from public roles, concentrating on the final draft of his treaty on regular solids, which he completed in 1485. He then codified the rules of perspective and maths as a guide for future artists, and wrote two fundamental works: De Prospectiva Pingendi (dedicated, quite probably, to Duke Federico da Montefelto) and Libellus de quinque corporibus regularibus, recently retrieved from the Urbino code 263 of the Vatican Library. He probably stopped painting due to poor eyesight, and eventually turned blind. Yet, in 1487, he still managed to personally write his own will. 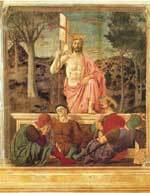 Piero della Francesca died on 12th October 1492, the day when Columbus discovered America.